Death Notification – Retired Sgt. 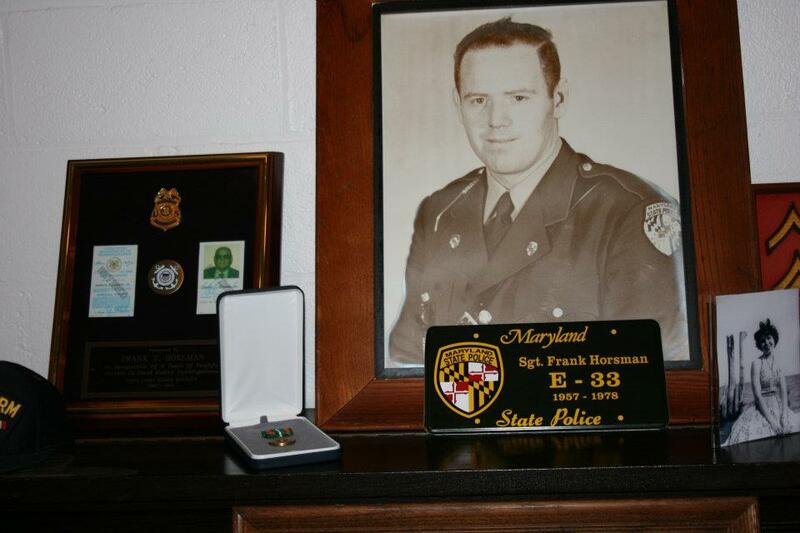 Frank Horsman, Sr.
Maryland Troopers Association > News > Deaths > Death Notification – Retired Sgt. Frank Horsman, Sr.
We regret to inform you of the death of Retired Sergeant Frank Horsman. Our thoughts and prayers are with Frank’s family and friends at this difficult time. SEAFORD, DEL. Franklin “Frank” Ewell Horsman Sr., of Seaford, formerly of Vienna, died Friday, Oct. 14, 2011, at Nanticoke Memorial Hospital of a massive heart attack. He was born Nov. 28, 1933, near Vienna, a son of the late Julian Clayton Horsman and Nellie Spear Horsman. Frank was a veteran of the Korean War and Operation Desert Storm. During the Korean War, he was in the U.S. Navy assigned to the Amphibious Forces. During Operation Desert Storm, he was in the U.S. Coast Guard as a chief investigator. He was assigned as the intelligence liaison and coordinator for the 5th Coast Guard District. After Desert Storm, he was assigned to Coast Guard Investigative Services and fought coastal drug smuggling until his retirement at age 60. He received several awards, including the European Occupation Medal, American Defense (2) and the Coast Guard Achievement Medal for his work with coastal drug smuggling. He was a former Maryland state trooper, appointed July 8, 1957, retired at the rank of sergeant in 1978. He was assigned at Barracks “A,” Waterloo; Barracks “E,” Salisbury; Barracks “F,” North East and Barracks “I,” Easton. He was a member of MSP during the riots and demonstrations in Cambridge, Salisbury, Princess Anne and College Park in the 1960s. He received two awards for his investigative abilities. From 1988 to 2001, he operated Horsman Investigations, a private investigative service, through which he investigated numerous criminal and motor vehicle accident cases for many law offices on the lower Eastern Shore. He was educated at Vienna High School, Maryland State Police Academy and attended the Law Enforcement Institute in College Park. He took law enforcement courses at Indiana University, in Bloomingdale, Ind. He was a certified drug investigator by the Bureau of Narcotics and Dangerous Drugs. He attended the U.S. Coast Guard schools for port security and executive protection. Frank enjoyed boating and for many years he piloted yachts to and from the Chesapeake Bay and Florida. He was a licensed commercial fisherman and owned several boats, including the Chesapeake Bay buy boat Sterling. Because of his maritime expertise, he was employed by the FBI in the 1980s in a criminal undercover sting operation in New York Harbor. He was a member of the Maryland State Police Alumni Association. He is survived by his wife, Barbara Massey Horsman, whom he married June 27, 1958; two sons, Capt.John E. Horsman, Delaware Capitol Police, and his wife Cindy of Milford, and Frank E. Horsman Jr. and his wife Linda of Cambridge; four grandchildren, Cpl. John F. Horsman, Milford Police Department, and his wife Penny of Milford, Cpl. Scott A. Horsman, Delaware State Police, and his wife Lauren of Middletown, Mandy Horsman Peters of Cambridge, and Kristin Horsman Caiola and her husband Billy of Milford; seven great-grandchildren, Tyler Horsman and Karley Horsman of Milford, Anna Horsman, Thomas “T.J.” Horsman, and Charlotte Horsman of Middletown, and Zachary Peters and Myra Peters of Cambridge; three sisters, Emma Jean Sellers of Vienna, Helen Morris of Parsonsburg and Sarah Louise Byrd of Millsboro; and several nieces and nephews. In addition to his parents, he was preceded in death by a brother, Capt. Darius C. “Bill” Horsman, Atlantic, Va., and two sisters, Margaret E. Apple, Ingleside, and Madeline Reid, Vienna. Funeral services will be held at 11 a.m. Thursday at Vienna United Methodist Church with a viewing one hour prior to the service. The family will receive friends from 6 to 8 p.m. Wednesday at Vienna United Methodist Church. Pastor Jonathan Willey will officiate. Interment will follow in St. Paul’s Methodist Church Cemetery at Harrison Ferry near Hurlock. Family members will serve as pallbearers. Sam DuPont, J. T. Wainwright, Ray Potter, Roger Curry, Ed Willey and Betty Bienert for Bill Bienert (deceased) will serve as honorary pallbearers. Memorial contributions in memory of Mr. Horsman may be made to The Horsman/Murphy/Willey Cemetery Fund, c/o Tommy Bradshaw, 5106 Rhodesdale-Vienna Road, Rhodesdale, MD 21659. The Zeller Funeral Home in East New Market is handling the arrangements.